This 5-storey Blob building which sits at the center of Eindhoven has been created to be an icon. 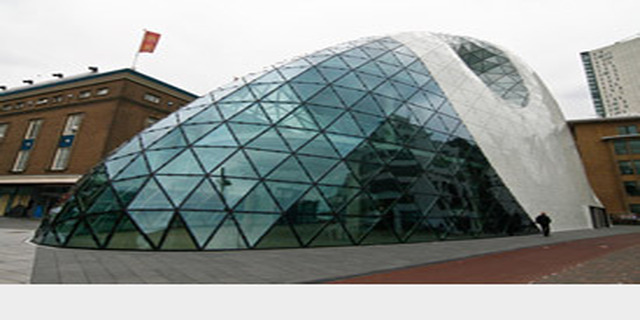 Designed by Italian Massimiliano Fuksas, it is an essential piece of the Eindhoven city skyline with its facade fantastically covered with steel and glass materials. The structure looks amazing at dusk and the sunlight reflects off the skin of the building. While the exterior of the Blob is both elegant and grand, the interior has platforms built from steel and glass. Take a look from the inside by visiting one of the shops currently residing in the building. A little Blob is to be built on the square in the future. Though at times controversial, Eindhoven is hard at work developing architectural beauty.